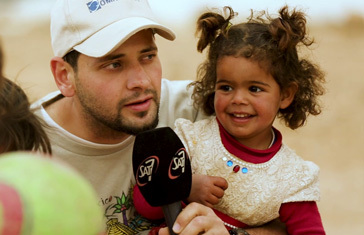 A SAT-7 Egypt crew recently visited refugee children in Jordan. As the team shared God’s love, the children showed them courage and humility. SAT-7 KIDS Channel Manager Andrea Elmounayer shares why these visits are so important. It is important for us to spend time with children whenever we can. It enables us to walk in our viewers’ shoes and better understand what they are facing. When we can see things from a child’s perspective – that forgotten view of the world that adults have left behind – we learn how best to meet their needs. Children see unfairness and injustice – they sense hatred and jealousy as well as true love and care. If a child is not nurtured by the love of God, they will either stray from the truth or abandon it entirely. It is our responsibility to guide children on a Godly path to help them discover the ultimate purpose of their lives. Children, like the young refugees we met in Jordan, often have very little hope for the future. They need to know that they are not forgotten, that someone out there still believes in them – and that there is hope in Jesus. We had the chance to show God’s love and guidance in practical ways. And in return, the children taught us so much. Despite their problems and needs, we vividly sensed their bravery, humility, and trust. Only when we witness these qualities first-hand can we understand why Jesus said, “Truly I tell you, unless you change and become like little children, you will never enter the kingdom of heaven” (Matthew 18:3, NIV). It is essential that we broadcast these visits on SAT-7 KIDS. Not only does it raise awareness about the plight of refugees, but it also enables us to talk about the children’s perseverance and courage; their feelings; their hidden hopes and dreams. Through watching these programs, SAT-7 KIDS’ young viewers develop compassionate hearts. They grow in love as they see and understand what other children are going through. They become better attuned to the needs of others. As they watch, children also discover that God’s blessings can be found even in the most isolated and difficult places. They meet face-to-face with God’s wisdom, love, and grace. They are prompted to ask big questions and to search for the truth. At SAT-7 KIDS, we aim to guide children – whether through our programs or in person. And in everything we do, we know God is at work.